India is a vast country of great distances with varied topography, climate, vegetation and people in such case a journey by bus or car is not comfortable, so railway is the best option in which a person can travel with comforts and all facilities. Even for short distances e.g. Delhi-Agra, Delhi-Jaipur, Bangalore-Mysore etc. railway get priority over airways because it does not need any check-in formality as airlines, so it takes less time. In several places, e.g. the hills, coastal areas, deserts, forest areas the journey by train gives a fantastic experience, so they are very popular. Sometimes the trains themselves are attraction due to their unique shape, furnishing, decoration, and services e.g. Palace on the Wheels, The Fairy Queen, etc. In this way, the journey by trains adds the value of journey in India. Indian Railways offer a great variety of tourist routes, passenger services and packages to travel across the country. Some of the train and facilities which encourage tourism are worth to mention. It is the oldest working locomotive in the world which was made in 1855. Its steam engine is the oldest working engine in the world. It has the prestige of having a place in the Guinness Book of World Records and also winning the National Tourism Award. It has also graced the National Museum, New Delhi. It is running between Delhi Cantt and Alwar, carrying only sixty passengers. It has two days package including a night stay at Sariska Palace Hotel (near Alwar), sightseen of Sariska Wild Life Sanctuary and back to Delhi Cantt. The Fairy Queen starts from Delhi and reaches the picturesque town of Alwar in Rajasthan the same day, from where the guests are taken to Sariska Tiger Reserve for an overnight stay. 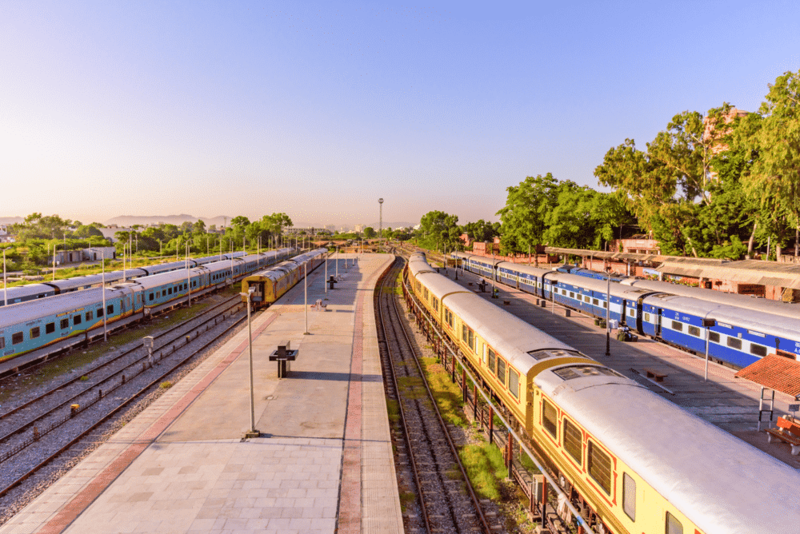 India Railway offers a unique two days all-inclusive package on the Fairy Queen. The Fairy Queen has a 60 seater specially designed air-conditioned chair car with a large glass window from where the passenger can have a frontal view of the locomotive, with a well-maintained pantry car for on board catering. The coach also has a beautiful lounge in the front, which provides the scenic beauty of the countryside. For the passengers’ enjoyment, numerous cultural programmes are organized on the evening of the first day at the hotel Sariska Palace. 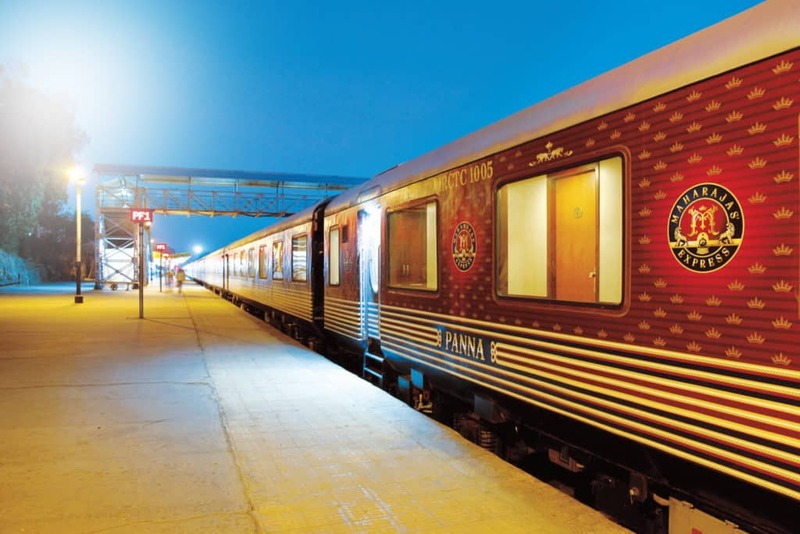 The Palace on Wheels has been rated as one of the 10 best luxurious train journeys in the world. Originally, the train had 12 fully furnished non-air conditioned saloons, which were once owned by the former maharajas, governor generals, and viceroys of the British period. The Palace on Wheels initially started as a unique holidays concept hauled by a steam engine on 26 January 1982. In 1991, a new air-conditioned meter gauge – Palace on Wheels, on the lines of the old heritage train, was launched. 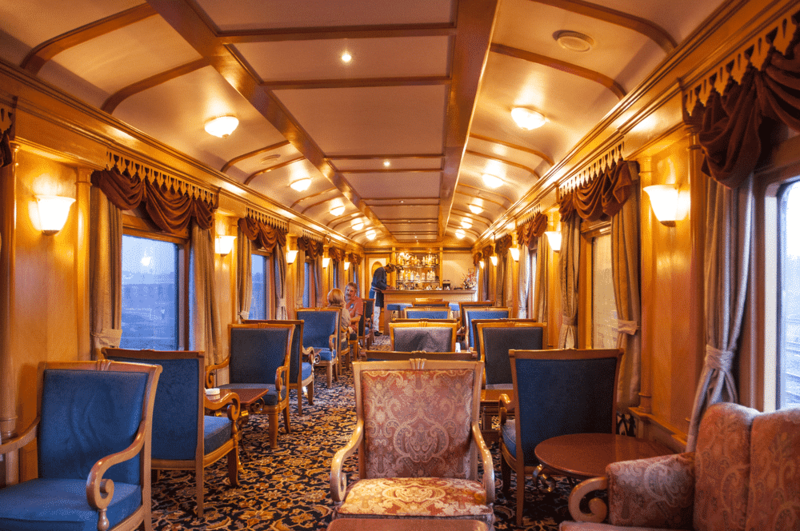 The interior of the current 14 saloons has authentic replicas of the historic coaches. Each salon is equipped with twin-bedded cabins, channel music, and intercom facility. The coaches are named after the princely states of Rajasthan. Everything matches with the colorful tradition of Rajasthani art. Panels and ceilings are covered with miniature and traditional music reflecting the pageantry of courtly life. Each saloon has a mini pantry and a lounge with beverages and refreshment and a place to relax, two exquisite restaurants, the Maharaja and the Maharani, with opulent draped curtains, elegantly crafted lights. Apart from the chef’s special of the day, there is a delicious choice of local Rajasthani, Chinese, and Continental cuisine. It is the most demanded train, offers a package of 7 days which include main destinations of Rajasthan with Taj Mahal in Agra (U.P). The itinerary includes Delhi Cantt – Jaipur – Jaisalmer – Jodhpur – Swaimadhopur, Chittaurgarh – Udaipur – Bharatpur, Agra – Delhi Cantt. The price of the package depends on season and type of berths i.e. single, double or triple occupancy. The train started in 1984 refurbished several times with lavish comfort, regal luxury, and Rajasthan heritage. The fully air-conditioned train has wall to wall carpeting, lounge, gym, beauty parlors, bars, and library. It has got one of the ten most famous train statuses in the world. Maharashtra Tourism Development Corporation Ltd (MTDC) in association with the Indian Railway Catering and Tourism Corporation (IRCTC), Ministry of Tourism has launched a super deluxe luxury train – The Deccan Odyssey. The train has been associated along with the best luxury trains in the world such as Blue Train of South Africa, the Orient Express of Europe, and the Eastern and Oriental of South-East Asia. The train reflects the ways of Indian royalty. Each coach is named after some of the best tourist places and forts of Maharashtra. The train has 21 coaches out of the which 13 are passenger cars, two presidential suites, one conference cars, two dining cars, two generator cars with luggage store, one staff spare car, one spa car, and one bar car. The train has onboard facilities such as air conditioning, business center with internet, FAX, ISD, and STD in the conference car, LCD TV in eleven lounge cars, plasma TV with allied equipment, one health spa car with steam, beauty parlor and gymnasium, music channel, cell phone on demand, foreign exchange facilities, laundry services, 24 – hour room service, valet attendant, special assistance for physically challenged people, luggage collection facility, guests are provided with arrival kits, fully stocked bar, daily newspapers and magazines, packaged drinking water, and mailbox facilities. Booking can be made through agents/internet, and assistance is provided for the travel arrangement on completion of the tour. The route of the train has been fixed as Mumbai-Ratnagiri-Sindhudurg-Goa-Kolhapur-Pune-Nasik-Aurangabad-Nasik and Mumbai. The itinerary is of seven days round trip starting every Wednesday from Mumbai. It includes a seven days package of Rajasthan & Gujarat. It is also similar to Palace on the Wheel in several respects. The itinerary includes Day 1 – Delhi Cantt., 2- Chittaurgarh, Udaipur, 3- Mahsana, Ahmedabad, 4- Sasangir, Ahmedpur Mandvi, 5- Palitana Sarkhej, 6- Ranakpur, Udaipur, 7- Jaipur and Day 8- Delhi Cantt. This train is also very popular among tourists. 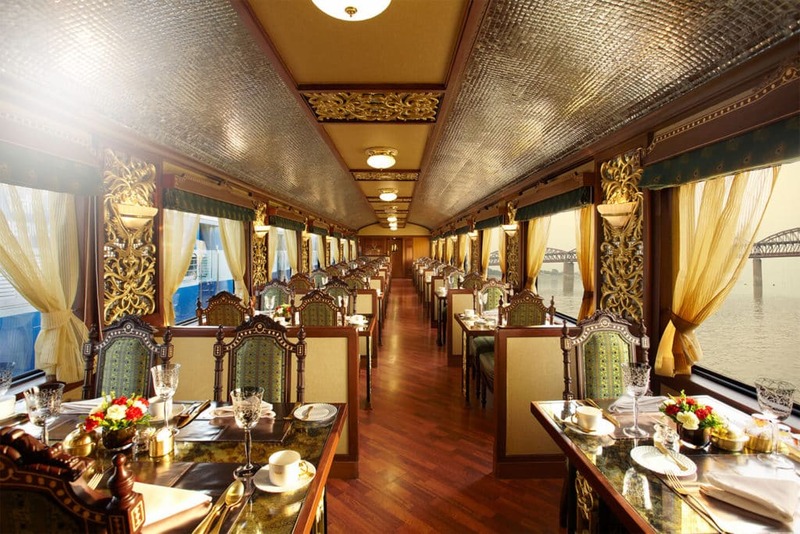 Maharajas Express is one of the luxuries tourist trains in India. It gives a perfect glimpse of Indian Raja & Maharajas royalty. It is the world’s leading luxury train in India. It won the World Travel Award for five consecutive years from 2012 to 2016. It includes an eight days tour package. The itinerary includes Delhi – Jaipur – Ranthambore – Fatehpur Sikri – Agra – Gwalior – Khajuraho – Varanasi – Lucknow – Delhi. Maharajas Express tours operated mainly the seasons of Oct. to Apr. The fare starting from $5,980 per person. Maharajas Express gives unforgettable memories of the hidden riches of India in its breathtaking beauty and its diversity. The train has four type of cabins as a deluxe cabin, junior suite, suite, presidential suite. This train has various restaurants, lounge & bar cars etc.